Sorry but this location has been Closed. 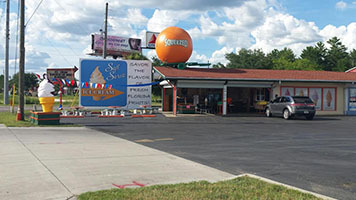 Ridge Island Groves Ice Cream Shoppe of Four Corners is now open and ready to serve you! We started out with a single flavor, our 'Orange Dream', which is made using our fresh squeezed orange juice. When word got out about the 'Orange Dream' and how it was like the old time "Dreamsicle", we realized that people love ice cream. Our customers began to suggest that we try making other flavors, so we did! All our flavors have been inspired by fruit that we grow year in and year out. Each fruit flavor has fruit directly from our farm in it and makes it taste fresh. We have also added some hand-dipped flavors, because when it comes down to it we like all ice cream. For those of you that might be in the mood for something different, we have Hawaiian Shaved Ice. All the flavors for both are listed above. We hope you will stop by and try some of our unique flavors!